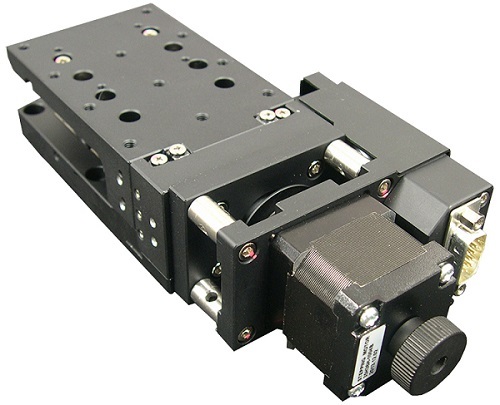 The AZ60-A Motorized Vertical Elevator Stage is a low-profile and compact 183.7 mm x 80 mm x 38 to 42-mm (raised) stage. It perfectly suited for low cost, high resolution, wedge type, vertical elevator applications requiring precise vertical positioning. The 60 mm x 87 mm (2.362 in. x 3.425 in.) drilled and tapped stage has a vertical travel of 4 mm (0. 157 in.). The crossed roller guides and a precision ground 8-mm-diameter 250 microns/turn lead ball screw provides smooth, straight (straightness to better than 5 microns). More after the jump. The stage delivers good parallelism (<20 microns to the mounting surface), and high resolutions to 1.25 microns (full step), 0.625 microns (1/2 step), and 0.125 microns (1/10 micro step), and repeatability to +/- 0.5 microns. Travel speeds are up to 2.5 mm/sec. The AZ60-A Elevator Stage is constructed of black-anodized aluminum alloy and weighs just 1.14 kg (2.51 lb). A powerful NEMA 14 1.8� 2-phase stepper motor has a double ended shaft with a knob for manual adjustments. This knob may be replaced with a quadrature encoder for position verification. The non-cantilevered moving wedge elevator stage has a Load Capacity of 7 kg (15.43 lb) without concern for loss of parallelism, and the base plate has easy to access holes for mounting.